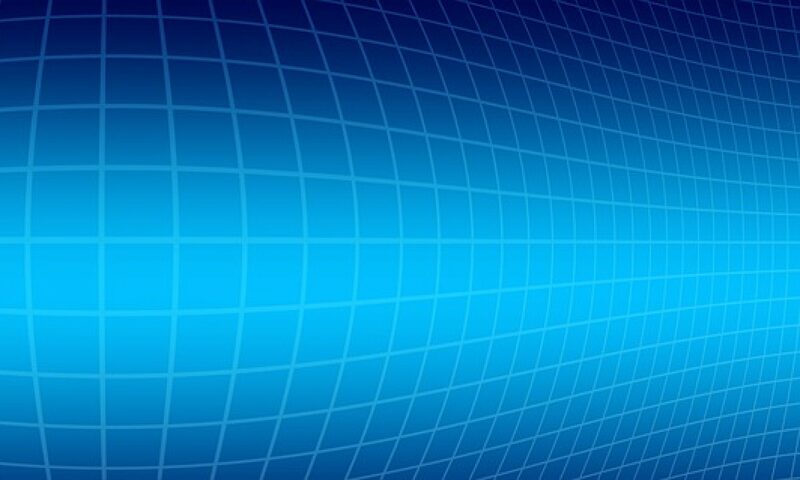 The Standard Operating Procedure (SOP) document management software assists the procedure of implementing new SOPs as well as revisions to SOPs. Management of the SOP document development and revision review procedure. The database we development presents all document management software functions in a user-friendly tabbed interface. 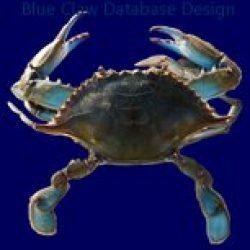 The database is infinitely expandable because most table attributes are list driven and all lists are easily maintained by the user. 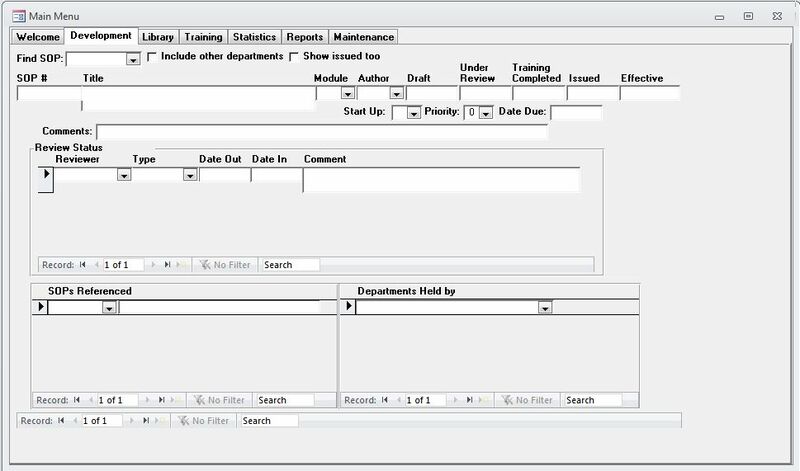 Two versions of the database front end were provided to Wyeth: A management version that is read-only and a supervisor’s version that provides update and edit capabilities. Additionally, the database serves to manage the instruction of employees for their job requirements. Each job requirement requires classes on many SOPs. 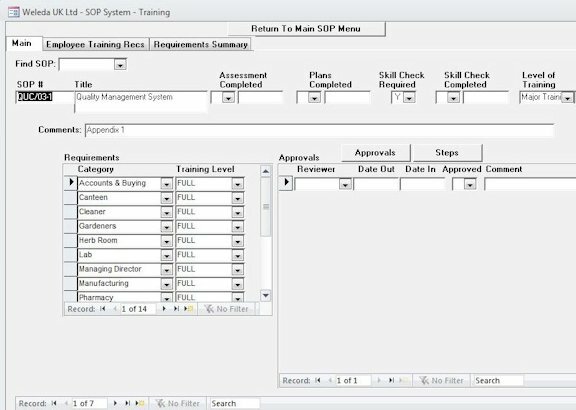 The training courses for each SOP also vary in length, and the database outputs reports to measure future class-load. Lastly, training on some SOPs must be refreshed at periodic intervals and varying levels of retraining are required when SOPs are revised. The Employee Training Recs tab provides a complete picture of the training requirement, both required, and met and missing, for each employee based on their job function (category). 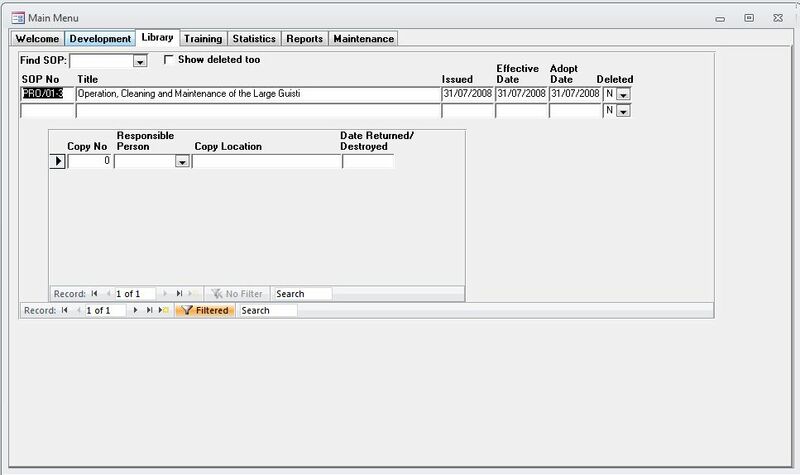 The Reports tab is simply a list of reports selectable by the user. A snapshot of this screen is not shown.